HomeArticlesThe Metro Hotel must pick up “more of the slack” says local Councillor. The Metro Hotel must pick up “more of the slack” says local Councillor. Financial aid from the government for the victims of the Metro Hotel fire in Ballymun is coming to an end, says councillor. The Metro Hotel are being asked by the Dublin City County Council to pick up “more of the slack” says People Before Profit Councillor for Dublin North West Andrew Keegan. There were 21 private apartments of the hotel destroyed by the fire which occurred on the 21st of March. With financial support for those effected by the fire coming to an end, Cllr Keegan said that the council felt the hotel could do more. “They (Dublin City Council) don’t feel its their baby… The hotel is covered to an extent with insurance… They’re (Dublin City Council) in talks with the hotel to pick up more of the slack.”, said Cllr Keegan. Cllr Keegan says that the council are still in talks with the hotel but, in the meantime that the council will “look after people as best we can”. 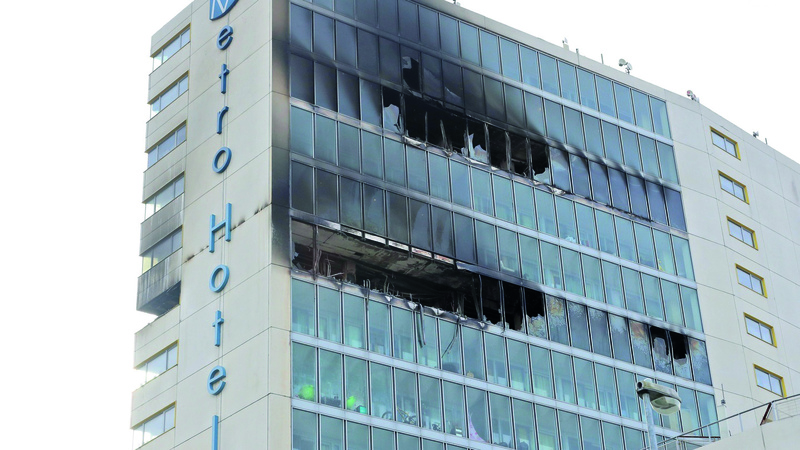 Despite Cllr Keegan’s claims that the hotel’s insurance could cover the cost of some 50 residents effected by the fire, the hotel has told tenants of four apartments on the 13th floor to consult with their insurers. The hotel, which is owned by a Swiss multi-millionaire who has invested €80 million on the Irish hotel market in recent years, has given “goodwill payments” to those effected by the fire. The payments given to the families range between €1000 – €2000 with the Hotel also covering some expenses occurred by the victims. On RTE’s Drivetime Councillor Noeleen, a former Sinn Féin party member and now independent councillor for Dublin North West, said that the families were given emergency accommodation in Ballymun Travel Lodge. A government led fire probe has yet to determine the cause of the fire.